Shops in the city centre cater for the residents of York as well as the tourist. You will find high street stores and speciality shops offering a range of souveniers and gifts for you take home for friends and family. Coney street is Yorks busiest shopping street, here you will find high street retailers competing for space in some of Yorks oldest buildings. Parliament street has a Fountain and this area is often used for festivals and exhibitions. 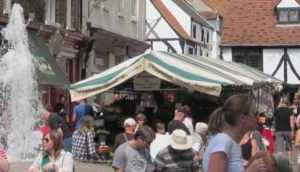 Stonegate and Petergate are particularly popular with Tourists and of course do not miss the world famous shambles.